What was, by all appearances, shaping up to be a circus of a Police Commission meeting quickly became a snoozy policy discussion that concluded with a 6-1 vote by the commission to adopt SFPD’s Taser policy. The whole room awoke in laughter. Indeed, before the meeting, a line of community members stretched down the hall of the City Hall’s fourth floor before they were let in small groups and packed into seats like sardines. But as the commissioners bickered over fine points of the policy’s legalese, half of the room gradually cleared out and went home. In the end, Tasers had already been approved — this was only a question of how they would be adopted — and there was a big elephant in the room: a failure by the commission to pass a policy would have given more credibility to Proposition H, a ballot measure written by the Police Officers Association to arm officers with Tasers by the end of the year — without the painstaking policy drafting undertaken by community stakeholders, the department, and the commission. “The commission did exactly what the Mayor asked them to do, and they did it tonight,” he said. Late last month, Police Chief Bill Scott publicly voiced his opposition to Prop. H, writing in a letter to the Department of Elections that it was the “antithesis” of the collaborative reform process. However, he said after the meeting that it was not his role to actively oppose it. “It’s not my role. I fulfilled my obligation of putting information out there of how it’s going to impact this organization,” he said. “The voters will have to make their own decisions,” he added. The commission did not vote on whether to oppose the POA measure, which had been scheduled. Commission President Julius Turman said they did not want to make any “political statements.” Yet, in his own way, Turman praised Scott opposing the measure. While for some, the discussion on Tasers was something like torture, for others it was like Monday Night Football. Stakeholders who had spent more than a year combing over the policy in the Taser working group and scrutinizing the draft policy — Department General Order 5.02, Use of Electric Control Devices — sat restlessly in the back rows, whispering over the policy as the commissioners took “straw polls” on whether to keep or can certain changes. 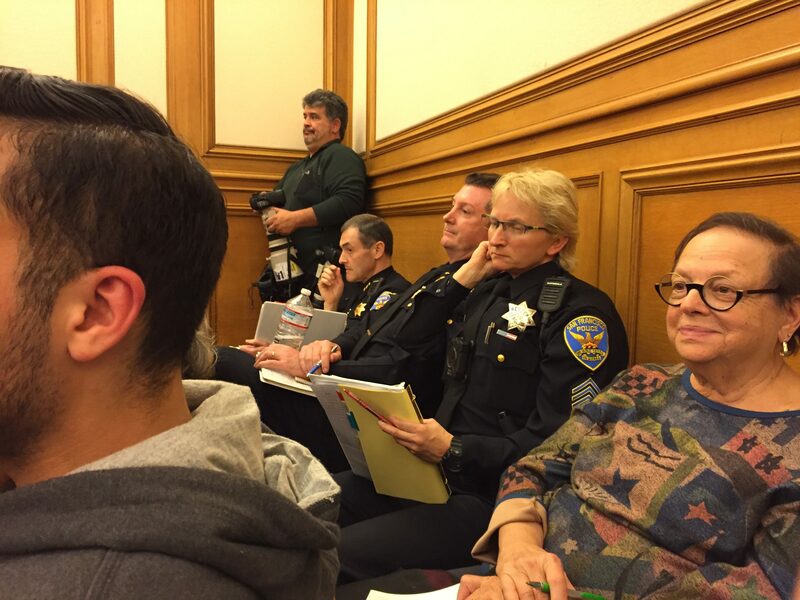 Likewise, SFPD’s command staff, also sitting in the back rows, seemed to parse Scott’s every word during his discussion of the changes. Under the policy, officers can use Tasers on someone who’s armed with a weapon other than a firearm, like a blunt or sharp object, and posing a threat to an officer or member of the public — injuring or threatening to injure someone. They cannot be used on people who appear to be obviously elderly or pregnancy, visibly frail, or on someone who appears to be a child. Officers are also not to use them if they have credible information that a person is suffering from a medical condition. Moreover, only officers who have gone through crisis-intervention training will be allowed to carry Tasers — what the commission decided should be called “weapons.” About half of the roughly 2,300 officers in the department have received the training so far. The weapons will likely cost the city at least $3.5 million, which includes the equipment and a “train the trainer” program provided by Taser International, the product’s manufacturer. After the meeting, Scott, looking relieved that the policy had gone through, said the rollout plan has yet to be developed. “There’s a lot of things that have to happen. We still have to implement a strategy for rolling them out,” he said.